Dan Wilson was a special guest for the New Standards holiday show Saturday at the State Theatre. His brother, Matt, is always a guest at the New Standards Christmas gigs, now in their eighth year. And, of course, John Munson is a member of the New Standards. You’ll recall that the Wilson brothers and Munson comprise three-fourths of Trip Shakespeare, a beloved late 1980s/early 90s Minneapolis band. Well, the New Standards had an extra-special guest Saturday. And we’re not talking about St. Paul Mayor Chris Coleman on bagpipes, though he was part of the mix. Standup drummer Elaine Harris returned to the Twin Cities for the first Trip Shakespeare live performance in 20 years. It was only two songs – “Susannah” and “Snow Days,” which has been a part of the New Standards holiday show every year. But it was an extra-special moment. Trip Shakespeare seemed a bit tentative on the first number but it was glorious to hear “Snow Days” by the ensemble that originated it – with the full blown New Standards orchestra pitching in at the end. What a treat to see New Standards’ Chan Poling, who in 2013 famously recorded the first Suburbs album in 27 years, sharing the piano with Dan Wilson, the now famous Grammy-winning songwriter who has worked with Adele, Pink and Taylor Swift, to name a few. As Munson said, “that represents 20 years of begging” for a Trip Shakespeare reunion. No one could have topped that trump card, but guests Dessa, the media darling doing her own rap/sung rewrite of “My Favorite Things,” came close, and Coleman’s kilt-clad bagpipe performance (as part of a quartet of pipers) added a new dimension to the Pogues’ “Fairytale of New York,” which the New Standards had done for Christmas before. Sweet-voiced Dan Wilson sang two new songs – his current single “Disappearing” and a country-tinged holiday ditty, “Are You Lonely Tonight, Mrs. Claus?” Matt Wilson offered an oldie, “Don’t Worry Baby,” that had been made famous by some other Wilson brothers, the ones in the Beach Boys. Too bad Matt started this in such a high key. Most other guests were familiar to folks who’ve been to previous New Standards holiday shows, which were always at the Fitzgerald in St. Paul. Jeremy Messersmith, Haley Bonar and Aby Wolf did solo vocal turns. Tim Frantzich recited a Robert Bly poem, and Timothy Young ,in what may have been his first New Standards holiday appearance, delivered an original poem, “He Has the Whole World in His Hands.” Veteran Minneapolis soul and jazz man Maurice Jacox, another New Standards newbie, also sparkled in his role as Marvin Gaye. Rupert, a fixture at New Standards concerts year round, danced in a devil’s outfit – which was easily the highlight of his holiday dance career and the dance highlight of Saturday’s show (the dancers always seem forced and under-rehearsed). As for New Standards themselves, they did their distinctive readings of tunes by the Replacements, Leonard Cohen and Dan Hicks & the Hot Licks with stand-out work by vibes ace Steve Roehm.,And, most importantly, the trio closed with Poling’s original “Christmastime Next Year,” which deserves to be the first contemporary holiday tune to become part of the seasonal songbook since Mariah Carey’s “All I Want for Christmas Is You” in 1994. Maybe Dan Wilson could pitch Poling’s piece to one of his superstar friends so the rest of the world can hear it. 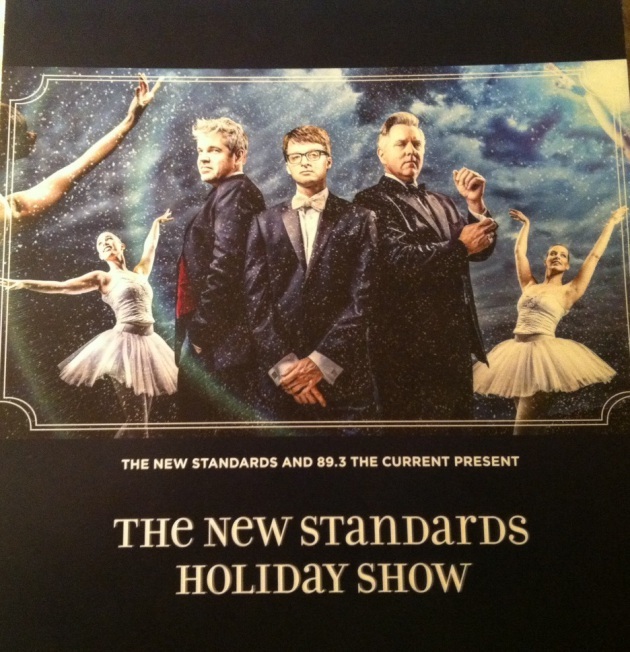 The New Standards will take their holiday show to Rochester, St. Cloud and New York. But first the trio has another performance at the State Theatre on Sunday night. Wonder if we’ll get a Suburbs reunion?